Scheduled for Friday to Sunday, September 30 – 2 October, the Billabong Junior Series features World Surf League (WSL) Junior Qualifying Series (JQS) 1,000 rated events for U18 boys and girls, as well as 3A rated Surfing South Africa (SSA) PST events for U16 and U14 boys and girls as well as U12 boys. Jordy Maree, who recently moved to Kommetjie, heads a strong 24-man field of entries in the U18 boys’ event where the points earned count towards the 2016 Billabong Junior Series and WSL Africa Junior titles as well as selection for the squad who will attend the WSL World Junior Championships in Australia in January. Maree faces tough opposition from WSL Africa rankings No. 2 Adin Masencamp (Strand), who heads the Billabong Junior Series rankings after winning the opening event of the series in Ballito in June. They will be under pressure from the likes of Kommetjie based brothers, Jake and Max Elkington; Bevan Wills (Umdloti), Jeffreys Bay’s Joshe Faulkner and Sebastian Williams (Durban). Kirsty McGillivray from nearby Jeffreys Bay is in pole position for both the WSL regional and Billabong series U18 girls’ titles after Ballito, but will be wary of the challenges presented by Sophie Bell (Salt Rock), Natasha van Greunen (Muizenberg), Olivia Izzard (La Lucia) and Cape St Francis local Crystal Hulett. Max Elkington and Sophie Bell in the U16 boys and girls, Tide-Lee Ireland and Gabi Lailvaux in the U14’s and Dan Emslie in the U12’s will be determined to add to their victories in Ballito and clinch the prestigious series titles in their respective divisions. The 2016 World Surf League (WSL) Africa regional Boys and Girls Junior Champions will be crowned at the Billabong Junior Series Final to be held at the high-performance right hand point break of Seal Point in Cape St Francis this weekend. 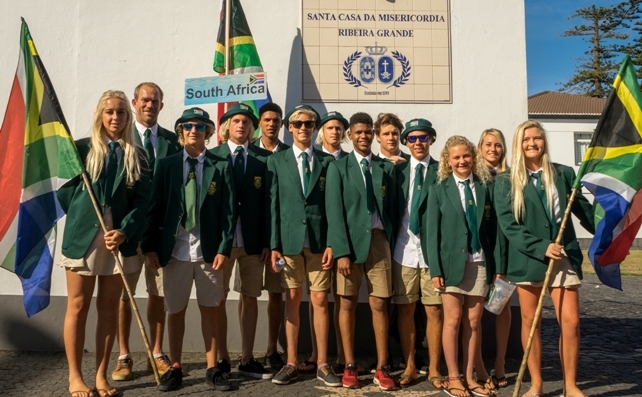 Scheduled for Friday to Sunday, September 30 – 2 October, the event showcases South Africa’s top 18-and-under surfers and, along with the prestigious event and series titles, the outcome will also determine the WSL Africa squad of four boys and two girls who receive coveted invitations to compete in the World Junior Championships in Australia in January 2017. After two events earlier in the year, the chase for the WSL Africa boys’ title is headed by Jordy Maree (Kommetjie) who holds a slender rankings lead over Adin Masencamp (Strand) with Jake Elkington (Kommetjie) close behind in third place on the leaderboard. Maree has accumulated 1,750 points by winning the Vans Pro Junior Surf Classic at Lamberts Bay in April and finishing runner-up to Masencamp in the Billabong Junior Series event at Ballito in June. Masencamp has 1,560 points from his win in Ballito and a third place result on the West Coast while Elkington has 1,310 from second and third place finishes in the two events. The next half-a-dozen ranked surfers can each force their way into the reckoning for a sought-after place in the WSL Africa squad for Junior World Champs with a high placing this weekend. They include Bevan Willis (Umdloti), Max Elkington (Kommetjie), Liam de Villiers (Richards Bay), Sebastian Williams (Durban), Alexander van Rijswijck (Port Elizabeth), Joshe Faulkner (Jeffreys Bay) and Ford van Jaarsveldt (Kommetjie). The battle for the WSL Africa girl’s crown, and places in the squad for Australia, is even closer with only the first Billabong Series event in Ballito already counting. Kirsty McGillivray (Jeffreys Bay) heads the standings with Sophie Bell (Salt Rock), Natasha van Greunen (Muizenberg) and Olivia Izzard (La Lucia) in close pursuit. Beyrick de Vries (uMhlanga) and Faye Zoetmulder (Cape St Francis) clinched the 2016 WSL Africa Men’s and Women’s crowns respectively after the final WSL Qualifying Series (QS) events in the region, the Quiksilver Pro Casablanca and the Roxy Pro Casablanca in Morocco earlier this month. The U18 Boys’ and U18 Girls’ events at the Billabong Junior Series, the world’s longest running series of junior events, are WSL JQS1,000 rated events sanctioned by WSL Africa. 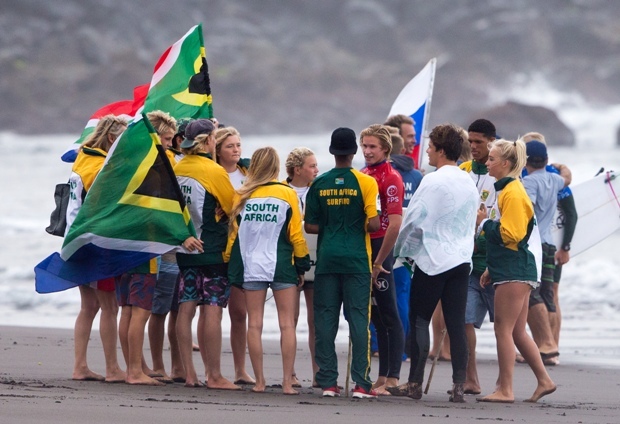 The U16 and U14 Boys’ and Girls’ events and the U12 Boys’ are sanctioned by Surfing South Africa (SSA), the national controlling body for the sport. CASABLANCA, Morocco (Sunday, September 18, 2016) – South Africa’s Matt McGillivray finished equal third in the Quiksilver Pro Casablanca in Morocco, a World Surf League (WSL) QS1,500 rated event that was co-sanctioned by the WSL Africa and WSL Europe regional offices. McGillivray, 19, from Jeffreys Bay, advanced through four rounds of competition before being defeated in the semi-finals by eventual runner-up Nelson Cloarec (FRA), earning US $2,000 (R28,000) and 840 points that saw him jump 10 places up the QS leaderboard to No 85 in his rookie season as a full-time professional surfer. Dylan Lightfoot (Jeffreys Bay) and Shane Sykes (Salt Rock), the only other South African men in the Quiksilver Pro Casablanca, finished equal 17th and equal 49th respectively. Emma Smith (Jeffreys Bay) was the only South African woman in the Roxy Pro Casablanca where she placed equal 17th overall. The Quiksilver and Roxy Pro Casablanca were the final events on the WSL Africa regional tour and saw Beyrick de Vries (uMhlanga) and Faye Zoetmulder (Cape St Francis) crowned the 2016 WSL Africa Men’s and Women’s champions. De Vries, currently the highest ranked South African on the WSL QS in 27th spot, won the Vans Pro Surf Classic at Lamberts Bay, placed third in the Cape Town Pro and fifth at the Ballito Pro presented by Billabong to accumulate 1,980 points, more than 500 ahead of runner-up Matt McGillivray. Zoetmulder was the runner-up at the Cape Town Pro and fifth in the Ballito Women’s Pro presented by Billabong, earning a total of 1,170 points, just 50 more than second placed Nikita Robb (East London). Tanika Hoffman narrowly missed out on the WSL Africa Women’s title. The 23 year-old from Hout Bay earned 1,000 points for winning the Cape Town Pro and only needed to collect the vest for her first heat in the Roxy Pro Casablanca to claim the regional women’s crown, but was unable to get a Moroccan visa in time and had to withdraw from the event. The 2016 WSL Africa Junior Boys and Girls Champions will be crowned after the second and final Billabong Junior Series event which runs from September 30 to 2 October at Seal Point in Cape St Francis. The WSL’s decision to change the Junior category from U20 age category to U18 this year has set up a closely fought battle at the top of the local rankings. Jordy Maree (Kommetjie), winner of the Vans Junior Pro Surf Classic, holds a slender 190 point lead over Adin Masencamp (Strand), winner of the U18 event at the Billabong Junior Series event at Ballito, with Jake Elkington (Kommetjie) also in contention just 250 points back in third spot. The Junior Girl’s title is an even closer race with Kirsty McGillivray (Jeffreys Bay) currently heading a group of six girls who could claim the WSL Africa crown with an event win at Seal Point. See all the results and rankings, both international and for Africa at www.worldsurfleague.com. The world’s best Qualifying Series campaigners will next meet in Portugal for the upcoming men’s QS10,000 Billabong Pro Cascais pres. by Allianz which starts on Saturday, September 24 and runs until 2 October. SAN CLEMENTE, California, USA (Wednesday, September 14, 2016) – South Africa’s Jordy Smith claimed victory at the Hurley Pro in California on Wednesday, defeating 2012 World Champion Joel Parkinson in the final of Stop No 8 of 11 on the Samsung Galaxy World Surf League (WSL) Championship Tour (CT) in 1 – 1.3 metre waves at the high performance cobblestone break of Lower Trestles. The win was Smith’s fifth on the Championship Tour, his second at Lower Trestles and his best result of 2016 season, earning the 28 year-old from Durban US $100,000 (R1.4 million) and 10,000 points which lifted him to No. 4 on the Jeep Leaderboard and firmly into the World Title race with three events remaining on the schedule. Smith’s tactics of staying in the inside position at the start paid off and he established a strong lead with a 6.0 and an excellent 8.17 early in the final as the two former event winners went head-to-head. But Parkinson responded with a 6.93 and a critical 8.43, the highest scoring ride of the clash, before Smith added a 7.63 to his tally. Without priority and three minutes on the clock, the Australian needed a 7.27 to take the win, but was not able to land the requirement. This event marks Parkinson’s best result of the year and his first finals appearance since the 2014 J-Bay Open where he also earned a runner-up finish. The 2004 Lowers Champion found his form once again, overcoming in-form local wildcard Tanner Gudauskas (USA) in a nail-biting semi-final duel to earn a place in the final against Smith. Parkinson moves up eight places to sixth on the Jeep Leaderboard. Tyler Wright (AUS) claimed her fourth Championship Tour victory of the season in an all-Australian final against six-time WSL Champion Stephanie Gilmore (AUS). The win sees Wright retain the Jeep Leader Yellow Jersey, increases her lead on the rankings and moves her ever closer to claiming her first World Title heading into the last three events. The two finalists have shared 19 head-to-head CT match-ups, with Wright taking her eighth win over Gilmore. Wright opened her account with an excellent 8.50 and 6.37 to put pressure on the six-time WSL Champion and Gilmore charged back with progressive surfing to lock in a 6.00, but still needed an excellent 8.87. With two minutes left, a set provided the finalists one last opportunity. Gilmore delivered a near-perfect 9.13 but Wright was able to improve her 6.37 with an 8.63 and take the win. Gilmore posted the highest heat total of the Swatch Women’s Pro in Round 4 and her runner-up finish sees the 2014 event winner move up from 7th to 5th place on the Jeep Leaderboard. “I love this place and this wave so it’s really nice to come here and get a good result,” said Gilmore. “Congrats to Tyler [Wright]! My goal is just to win an event this season. Since my injury I haven’t really put together a complete performance so we’ll see what happens heading into Europe and in Hawaii, which is a favourite. South Africa’s Bianca Buitendag was eliminated in Round 2 of the Swatch Women’s Pro, finishing equal 13th and dropping from 10th to 12th on the Jeep Leaderboard. The 22 year-old from Victoria Bay will be determined to deliver great results in Europe and Hawaii to force her way back into the top 10 in order to re-qualify for a fourth successive year on the CT. The next event on the 2016 Samsung Galaxy WSL Championship Tour will be the Cascais Women’s Pro, which will see the world’s best female surfers go head to head in Portugal from September 24 – 2 October. The next CT event for men is the Quiksilver Pro France from 4 – 15 October. Cape Town’s Michael February posted best result of his professional career on the World Surf League (WSL) Qualifying Series (QS) in the Azores on Saturday, while Durban’s Jordy Smith advanced directly into the Quarterfinals of the Hurley Pro Trestles, Stop No. 8 of 11 on the Samsung Galaxy WSL Championship Tour (CT), in California later the same day. Competing in the QS6,000 rated Azores Airlines Pro, February cut a swathe through the top seeds in the event before being narrowly pipped in the semi-finals, finishing the event in equal third place with earnings of US $5 500 (R77 000) and 3 550 points. Despite still wearing strapping on the ankle he injured before the Ballito Pro in June, the 23 year-old from Kommetjie benefitted from his powerful manoeuvres and excellent strategic decisions to defeat higher rated opponents such as Pat Gudauskas (USA), Mitch Coleborn (AUS) and others before falling to eventual event winner Ian Gouveia (BRA). His record setting points haul sees February leapfrog 45 places up the QS leaderboard to No. 35, which cements his place in the remaining top rated QS10,000 events at Cascais in Portugal next week, and the two season-ending Hawaiian events in November and December, and assures him of preferential seeding in those events. February is now less than 5 000 points off the Top 10 on the QS rankings, and 1 000 points behind Beyrick de Vries (uMhlanga), whose 73rd place result in the Azores dropped him three places to No. 27 in the rankings. Although they will be up against the world’s best at Cascais, and particularly in Hawaii, the pair has the opportunity to challenge for a top 10 yearend finish and qualification for the elite 2017 WSL CT.
Jordy Smith propelled himself into the 2016 World Title race with a towering display in his Round 4 match-up at the famed high-performance cobblestone break of Trestles on Saturday afternoon. Posting a pair of scintillating 9.0 point rides, the lanky resident of nearby San Clemente dispatched Michel Bourez (PYF) and Kelly Slater (USA) to cutthroat Round 5 elimination heats while progressing directly to the last eight himself. “Going into that heat with Michel [Bourez], obviously one of the most powerful surfers in the world, as well as Kelly [Slater] — I just wanted to do my best surfing and Round 4 allows you to be a lot more free,” said Smith, who narrowly scraped through his Round 3 heat earlier in the day. Ranked equal No. 5 on the Jeep Leaderboard coming into the event, Smith is now the highest seeded surfer left in the contest after a series of major upsets saw rankings leader John John Florence (HAW), Matt Wilkinson (AUS), Gabriel Medina (BRA), Adrian Buchan (AUS) and Julian Wilson (AUS) all eliminated from competition. Having already earned 5 200 points, enough to see him move into fourth place in the rankings, Smith will face the winner of the Round 5 duel between Bourez and giant-killing wildcard Brett Simpson (USA) when competition resumes. A repeat of his 2014 victory at Trestles would see Smith move to within 1 000 points of a top three berth heading into the last three events of the year on the CT in France, Portugal and Hawaii. Bianca Buitendag was eliminated in Round 2 of the Swatch Women’s Pro at Trestles last week, finishing equal 13th in the event where she was runner-up last year. Sitting right on the qualification bubble going into Stop No. 7 of 10 on the Samsung Galaxy WSL Women’s CT, Buitendag is likely to drop out of the Top 10 who automatically re-qualify for the elite top tier as several lower ranked women are still in contention in California. With a QS ranking of No. 166, the 22 year-old from Victoria Bay in the Southern Cape, who ended last year ranked a career-high fourth on the CT, will be determined to post good results in the remaining three events of season in Portugal (Cascais), France and Maui in Hawaii in order to retain her seat at Women’s surfing’s highest table. The 2016 WSL Africa regional titles for Men and Women will be up for grabs in Morocco when the Quiksilver Pro Casablanca and Roxy Pro Casablanca, both QS1,500 rated events, start tomorrow in front of the Anfaplace Shopping Center in the city. The second edition for Men and inaugural Women’s event are co-sanctioned by WSL Africa and WSL Europe with the points earned counting towards the surfers’ respective regional rankings. While WSL Africa rankings leader Beyrick de Vries and second placed Micheal February have opted to remain in Europe to practice for the QS10,000 rated Cascais Pro in Portugal starting next weekend, third ranked Dylan Lightfoot and fourth ranked fellow Jeffreys Bay resident Matt McGillivray will be determined to claim the coveted WSL Africa title, won last year by David van Zyl (Glenashley). The champions from each region are guaranteed entry into all the major QS events in the following year which is a huge advantage for any surfer hoping to qualify for the elite WSL Championship Tour. Tanika Hoffman (Hout Bay) and Emma Smith (Jeffreys Bay) will be aiming to overtake current rankings leaders Faye Zoetmulder (Cape St Francis) and Nikita Robb (East London) to clinch the regional Women’s title. Hoffman, currently third, only needs to collect her vest for the first heat to take the lead, but will be wary of Smith who can grab the title by finishing first or second in the event.